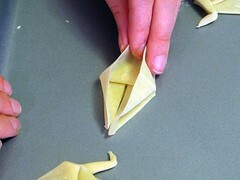 Play with your food: Edible Origami. Crane croutons for your salad. 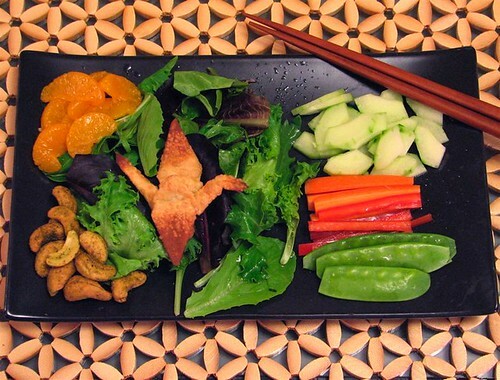 Crispy wonton wrappers add cheerful crunch to an asian salad, but shouldn’t they be… more interesting? Presented here is the ideal upgrade. No more must you clutter your salad with amorphous crispies or chow mein noodles to obtain the requisite crunch: Crane Croutons will be your piece de resistance. 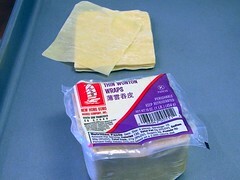 Wonton dough is strong, flexible, and comes in a nearly square form. If it is not square enough for your taste (you perfectionist, you!) it can be easily edited to the correct shape with a pizza cutter. We do not suggest using chinese style spring roll/egg roll wrappers. They are somewhat foamy and do not hold their shape well, which makes them difficult to work with. After we got excited about this idea, we checked to see if it had been done before. (Yes, we know that most good ideas are rediscoveries.) The Paper Discovery Center mentions an origami artist who has used wonton dough, but we can’t find substantial documentation of it anywhere. 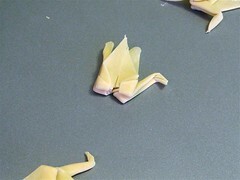 We recommend making a crane with paper before you try with wonton wrappers. There are many sets of origami instructions out there. A couple of acceptable ones for cranes are here and here. If you’ve made cranes before, you can probably follow along here just fine. 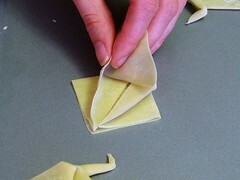 If you fold paper back and forth enough times, it will break; the same is true for wonton wrappers, only more so. You can do a little bit of regluing with water, but don’t rely too much on that. Absolutely square is ideal for origami paper, but since wonton wrappers are a little bit stretchy, you can usually make them do your bidding even if they aren’t quite perfect. While you are folding, keep the rest of the wrappers sealed in a plastic bag or covered with a damp cloth. As they dry out they become brittle, which is not helpful. 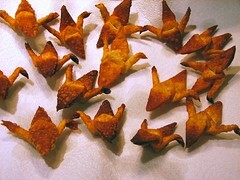 Here is a supply of origami paper/wonton wrappers/embryonic crane croutons. We get them at a local asian market. They have a couple of brands, shapes and thicknesses. Get the thinnest square ones you can. Fold the square in half to form a rectangle. Draw one corner toward the other to make a diagonal fold from corner to center. You should end up with a nifty trapezoid (trapezium, not trapezoid if you’re using British English). 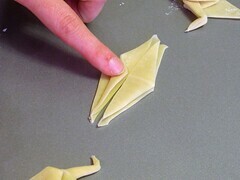 Fold the pointy corner in to form a square again. 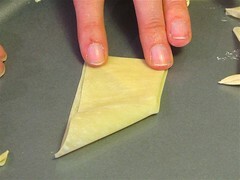 Here’s the tricky bit – if you pre-fold edges in to form a kite shape, you may crease the dough to the breaking point. It is best to lift up one layer of dough and gently guide it into the rhombus shape with your fingers. 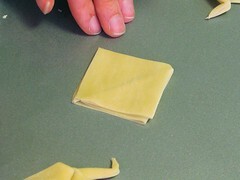 Fold the sides in to taper the head and tail. Turn over and repeat. 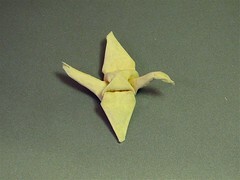 Open one side slightly and fold up to form the head or tail. Press the dough firmly together at the top – there are a lot of layers there and they need to be coaxed into shape. Fold up the other side and fold down the head. The head isn’t going to fold neatly unless you were an extreme perfectionist in earlier steps. That is a lot of layers and they are quite a bit thicker than paper. Treat it like clay; give it a little bit of water and firm pressure. You can open the wings and press down on the back gently to expand it. 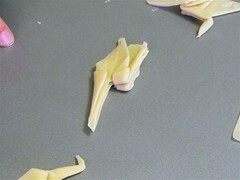 Alternately, you can fold down one wing like the ones in the edges of this picture. Depending on your cooking method you will want one or the other. One way to cook your crane is to microwave it for about 30 seconds on high. The surface will bubble. 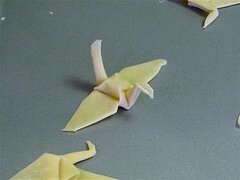 Microwaved cranes are keep their three dimensional shape beautifully. They stay a pale white which contrasts well with salad greens. However, they are rather bland, much like a dried-out flour tortilla. You can also deep (or shallow) fry them briefly on each side until they turn a golden brown which shades to a paler color in the center where there are more layers. It is easy to overcook them, so be watchful. 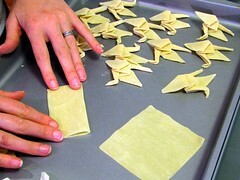 Three dimensional shapes tend to roll around in the oil and do not cook as evenly, so fold down one wing for these ones. After deep frying, they are crispy and flavorful. We made a lot of fried ones after tasting the microwaved one. Serve on greens with ginger sesame dressing, cherry blossom shaped carrot slices, snow peas, or whatever suits your fancy. Alternately, serve by themselves with some dipping sauce, maybe a nice satay sauce? Additional origami shapes that might work: Boxes, Throwing Stars, Irises… the possibilities are endless. This entry was posted in Art, Play with your food and tagged art, food. Bookmark the Permalink. Our favorite Thai restaurant serves an appetizer consisting of cream cheese filled fried wontons. It’s *pretty damned amazing* how good that tastes. This is the coolest use of these cranes I have ever seen! I love the idea for putting cream cheese in the body. I will be making this next time I make stir-fry. Brilliant, thanks. You know, there are a lot of foods that are similar to clay, too. Take a look at the dessert sushi for some inspiration about edible “clay” origami! <a href="http://i102.photobucket.com/albums/m94/rocketrox/08112009_cranes2.jpg">One</a&gt; and <a href="http://i102.photobucket.com/albums/m94/rocketrox/08112009_cranes3.jpg">Two</a&gt;. The images are huge–directly from the camera–so be aware. Thanks again for a fantastic idea! This totally made my night, we were playing with wonton and eggroll wrappers all night wrapping this and that and i came upon this site and had to try it, they came out awesome! thanks for the great idea! !